A 2014 RAM 1500 QUAD CAB BIG HORN 4X4 FOR ONLY $16,995.00! THIS TRUCK IS AN ADULT-OWNED, LOCAL TRADE. BOTH THE INTERIOR AND EXTERIOR ARE IN EXCELLENT CONDITION. WE HAVE FULLY SERVICED AND INSPECTED THIS RAM AND HAVE INCLUDED A GENEROUS WARRANTY AT NO ADDITIONAL CHARGE. EQUIPMENT INCLUDES THE BIG HORN PACKAGE, TRAILER PACKAGE, RUNNING BOARDS, TONEAU COVER, ALUMINUM WHEELS, AND MUCH MORE. THIS RAM RUNS AND DRIVES GREAT! THIS IS A VERY NICE TRUCK. CALL US TODAY. 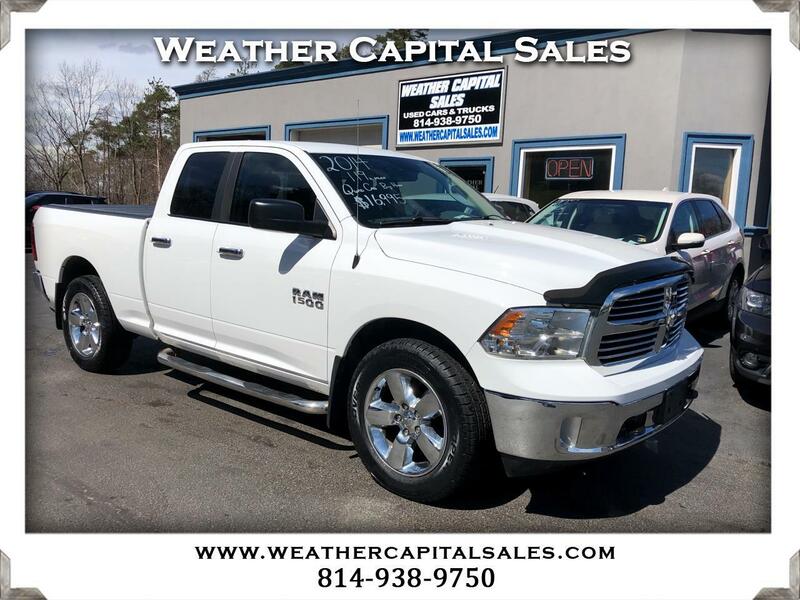 Visit Weather Capital Sales online at www.weathercapitalsales.com to see more pictures of this vehicle or call us at 814-938-9750 today to schedule your test drive.